here’s the latest news from inquirer.net correspondent, Matikas Santos about the arbitration case between the Philippines and China on the West Philippine Sea (in the South China Sea) and what China’s calls “nine-dash line”. 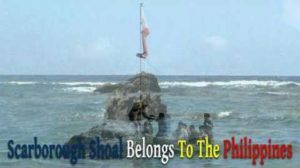 It has finally been decided that the Philippines has exclusive sovereign rights over the West Philippine Sea (in the South China Sea) and that China’s “nine-dash line” is invalid, according to the United Nations (UN) Arbitral Tribunal. The Tribunal issued its Award Tuesday after several months of hearings and submission of documents. China was absent throughout the proceedings, refusing to recognize the case. “The Tribunal concluded that there was no legal basis for China to claim historic rights to resources within the sea areas falling within the ‘nine-dash line,” the statement released to the media said. 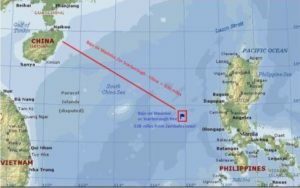 “Having found that none of the features claimed by China was capable of generating an exclusive economic zone, the Tribunal found that it could—without delimiting a boundary—declare that certain sea areas are within the exclusive economic zone of the Philippines, because those areas are not overlapped by any possible entitlement of China,” it added. The Tribunal also said that China has violated Philippine sovereign rights. “Having found that certain areas are within the exclusive economic zone of the Philippines, the Tribunal found that China had violated the Philippines’ sovereign rights in its exclusive economic zone by (a) interfering with Philippine fishing and petroleum exploration, (b) constructing artificial islands and (c) failing to prevent Chinese fishermen from fishing in the zone,” the tribunal statement said. “The Tribunal further held that Chinese law enforcement vessels had unlawfully created a serious risk of collision when they physically obstructed Philippine vessels,” it said. The Spratly Islands and its many reefs are being claimed by China under its “nine-dash line” claim that covers nearly the entire South China Sea including parts of the Philippines’ Exclusive Economic Zone (EEZ). China insists it has “historic rights” in asserting its ownership of the region believed to be rich in natural gas resources and also a vital trade route for international cargo ships. 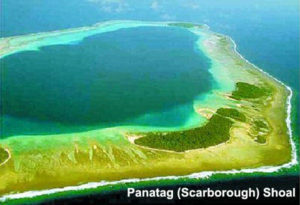 Philippines filed its case in January 2013 following a tense standoff between Chinese and Philippines ships at Scarborough shoal in April 2012. 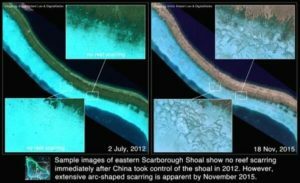 Since the initiation of the arbitration case, China has conducted several massive reclamation projects to turn submerged reefs into artificial islands capable of hosting military structures and equipment.